Recorded at Temple Records Studio with producer Robin Morton, Karen's new CD will be released on 24 May. It features all three of Scotland's harps, the modern gut-strung levered harp, the wire-strung clarsach of the Highlands and Gaelic culture and the bray harp from the Renaissance and Baroque period with it's sitar like buzz. 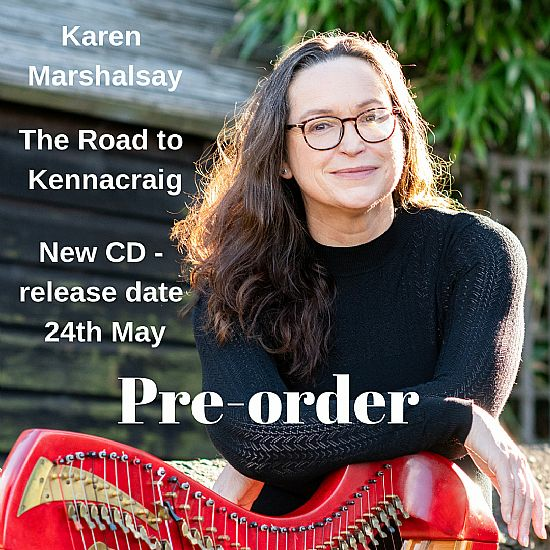 The new CD will be released on 24 May but you can pre-order a copy here and it will ship to you beforehand - exact date tbc! Please select correct postage area from the drop down menu.